Carhartt, America’s premium workwear brand since 1889, today released a short video to mark the conclusion of its “Strikeouts for Vets” campaign, which took place throughout the duration of the 2016 baseball season. The video features a check presentation from pitcher Madison Bumgarner, and a brief message to those players who graciously struck out throughout the season for a good cause. Fellow players Adam Duvall, A.J. Reed, Jon Jay, and Matt Adams – each of whom were among the batters Bumgarner struck out in 2016 – are also featured in the video, where they express enthusiasm in sacrificing their batting averages to help raise $125,500 for veterans. Helmets to Hardhats is a national nonprofit program that helps military service members successfully transition back into civilian life by offering them the means to secure a quality career in the building, trade, and construction industries. Bumgarner finished the season ranked third in his league with 251 strikeouts, setting a new career high, surpassing his 2015 total of 234 strikeouts. 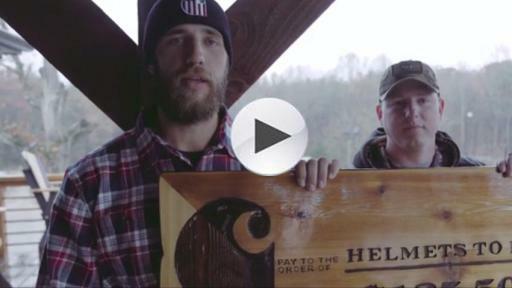 Carhartt became a proud supporter of Helmets to Hardhats in 2014. Carhartt’s “Made In The USA” products feature hangtags that promote awareness for Helmets to Hardhats, and Carhartt has pledged to donate funds annually to Helmets to Hardhats, regardless of sales. Helmets to Hardhats works closely with over 15 trade unions and 10 associations and corporations to source job openings and training for candidates. Once workers become a member in a building and construction trade or as a management employee and they work hard, they are entitled to a future with high pay, great medical insurance and one of the best pension plans in the nation. To learn more about Helmets to Hardhats, please visit www.helmetstohardhats.org. Established in 1889, Carhartt is a global premium workwear brand with a rich heritage of developing rugged products for workers on and off the job. Headquartered in Dearborn, Michigan, with approximately 5,400 associates worldwide, Carhartt is family-owned and managed by the descendants of the company’s founder, Hamilton Carhartt. For more information, visit www.carhartt.com and follow @CarharttNews on Twitter.